Last week, there was some attention paid to a recently-opened store in north London called “Really British.” Its owner Chris Ostwald says that he is in the business of selling “quintessentially British items” made in the United Kingdom, such as traditional British condiments, Union Flag tea towels and pillows, miniature red telephone booths, models of the Queen, and socks made by a Welsh company which produces them for Prince Charles. However, he and his store have stood accused by local residents of racism and instilling hatred by having a name – Really British – which suggests an attempt to divide between British goods and foreign ones or provoking prejudice against foreign ones. Some people felt that this had something to do with promoting Brexit and raising a middle finger at those who voted to remain in the European Union and otherwise promoting anti-foreign behavior, along with being culturally insensitive. With that in mind, I believe there is nothing wrong with promoting the UK and expressing pride in it, especially within the country itself in or out of the EU. Indeed, through the last couple of years, I have been disconcerted by the apparent reluctance of a substantial number of Britons to show some pride and appreciation in their country and worse, who are very cynical, dismissive, and ashamed of its heritage, institutions, and symbols which have contributed to its character, way of life, and how it is seen at home and abroad. As a foreigner looking in from across the Pond, I have spent much of life being heavily interested in the UK from a variety of angles: historical, societal and cultural, political and constitutional, the Special Relationship with the United States, and among other things. It started with the great British ocean liners and Harry Potter, and has come a long way from there. Nowadays, I have become so deeply immersed from afar that I have “adopted” the UK as my second country for which there is an appreciation, respect, and love rivaled only by that which have I for my own country. It is therefore dispiriting to see the lack of such feeling in Britons themselves. At best this has resulted in somber indifference and at worst, a corrosive cynicism which actively mocks and looks down upon the country and everything about it to the point where people are ashamed of the country and come very close to feeling that it has no worth, value, or redeeming qualities. Without these attributes to pave the way for a healthy patriotism, there is a lack of emotional attachment to the country and hostility toward things such as the Union Flag, and at that point, how long before people come to the conclusion that perhaps the country should simply be cast into the dustbin of history? Indeed, I believe that this is one reason why the SNP has been able to take hold the way they have in Scotland and came close to breaking up the UK in the 2014 referendum. Having been closely involved in UK matters for the better part of the last 4-5 years in part because of the referendum and its aftermath, I can understand that the reluctance and even hostility to embrace Britishness – and for that matter feeling ashamed to be British – has to do in part with the rise of the far-right and its use of the Union Flag and other British symbols in their iconography, paraphernalia, and propaganda. It is also understandable that some people may be uncomfortable with Britishness because of the outcome of the EU referendum and the more unfortunate and deplorable events that have happened since and even during the referendum, such as the murder of Batley and Spen MP Jo Cox by a mentally disturbed white nationalist who is claimed to have shouted “Britain first” or “Put Britain first” as he carried out the attack. This and other actions directing hatred and malice toward others is unacceptable; it does not represent the Britain I have come to know and is not a mark of showing pride in the country. Such individuals and groups may wave the Union Flag, sing the great national songs, and speak in the name of Queen and Country, but all they have done is help to give the Union Flag and other symbols of Britishness a bad name, even at home, which has lead to the reactions against the Really British shop. Now, it is my belief that Union Flag waving is not bad in and of itself, and I like it when watching special events such as the Last Night of the Proms, royal occasions, and Trooping the Colour. It is not necessary to do (and nobody ought to be forced to do so), but can be a healthy expression of patriotism so long as it is not used in an aggressive manner with the purpose of intimidating certain groups of people and attempting to divisively exclude them from society. For my part at home, I hardly wave a US flag during the year, not even on special days such as Memorial Day and Independence Day, and we don’t (as of now) have a flag pole at home. However, I do appreciate those who do decide to have a flag flying at their home or business, or wave it on certain occasions, and whenever I get in on the act, I do it – as so many others do – as an expression of love and appreciation for the land we call home and not hatred for anyone. Going along with this theme in the UK, there is also nothing wrong with singing the national anthem, God Save the Queen, or for that matter, Land of Hope and Glory, Rule Britannia, and I Vow to Thee My Country. All of them have their place in various events throughout the year, such as the first three at the Last Night of the Proms and the fourth one on Remembrance Sunday, and their own way, are positive expressions of British pride. I especially like I Vow to Thee for its touching, peaceful, and very thoughtful expression of love for country in much the same way as God Bless America. The point is that there is a difference between good-hearted patriotism and ugly nationalism, and a balance must be struck in showing ones appreciation and respect for the country that is the United Kingdom without devolving into that nationalism which divides and discriminates. If anything, I believe that it is past time for the vast majority of sensible Britons to reclaim their flag, monarchy, national songs, and other symbols from the far-right and they need to do so in a way which emphasizes that such things are for everyone who calls Britain home. Racists and white nationalists use our flag as well, but we as Americans – the vast majority of us – do not allow them to define who we are as a people and as a country; under no circumstances do they own them and nor do they have ownership of what it means to be American. This applies just as well to the UK with regard to how the country as a whole ought to deal with its symbols being hijacked by extremists. The British patriotism that I speak of and believe in is one which places faith in the country, and therefore acknowledges that the country is bigger and more consequential than any extremists claiming to speak for it. This patriotism is also bigger than the government of the day, so that there’s much more to the UK than Theresa May, just as there is more to the US than Barack Obama or Donald Trump. This leads to the ideal that patriotism is about the power of the individual and what he or she does to positively contribute to society, however big or small and regardless of where they come from, and therefore gets to the heart of the British patriotism I have in mind – one which combines the best of the UK’s traditions and heritage with the best of the modern culture in the country today, which has come by means of immigration and an increasingly interconnected world. After all, my deep and abiding interest in the United Kingdom and to connect with some of its citizens rests on the global nature of our world today. Make no mistake that when I think of the UK, I do indeed think of – in part, at least – things such as the monarchy and the Union Flag, Big Ben and Edinburgh Castle, hackney cabs and red telephone booths, bulldogs and tea, Burns and Shakespeare, and the Beatles. And I have to say that in my opinion, the ITV reporter was making too much of a big deal about the lack of diversity in the Really British shop by repeatedly commenting on it not reflective of modern Britain, and claiming that it was representing something of a stereotypical Britishness. Those were very encouraging and positive statements about what it means to be “Really British” and proud of it in a way that is inclusive of all backgrounds and showing no malice toward others. Indeed, being British should be about bringing the people of the country together to find what they have in common and understand that they have much more that unites than divides them. In the course of time, I believe this means that the owner should include others things in his shop that are expressive of the United Kingdom in the 21st Century. Reading the Harry Potter books and watching the subsequent films during the last decade provided a glimpse into the reality that modern Britain is diverse place and his store should reflect that. However, there’s nothing particularly wrong with the shop as it is and at the end of the day, all the Otswald is doing is selling towels, tea, marmalade, and flags representing the country in which his store is located. At the end of the day, there is nothing wrong with a healthy display of patriotism and this man appears to have achieved that with a shop peacefully promoting Britain to Britain, as well as to visitors (hopefully such as myself one day). He and everyone in the country can and should work together to help shape and define what being British means and take some pride and appreciation in that for themselves, the country, and future generations. One of high points for the United Kingdom this year was Major Tim Peake's mission aboard the International Space Station, which began on December 15, 2015 and ended on June 18, 2016. During those six months, Major Peake fascinated and inspired people back home in Britain and throughout the world by carrying out mission objectives alongside his fellow ISS crew members from other countries, such as repairing a failed voltage regulator which made for Peake becoming the first British astronaut to participate in a spacewalk. Along the way, he kept everyone up-to-date with his engaging social media posts on Facebook and Twitter, including his participation in the London Marathon on a treadmill – making him the second person to run a marathon in space, various videos highlighting his life aboard the ISS, his support for British sports teams, and remarks for occasions such as New Year’s Day and the Queen’s 90th birthday. Perhaps my favorite aspect of Major Peake's journey was when he shared photographs of various locations in the US, UK, and throughout the world from the ISS, including fabulous views of picturesque auroras. It is indeed true that one cannot fully appreciate the world unless it is viewed from that vantage point. For Major Peake, it all must have been an incredible experience – one which he appeared to thoroughly enjoy for every minute. Even before he returned home, he was being celebrated as a hero throughout the UK and there was great interest in his mission from the public via several platforms, particularly social media. 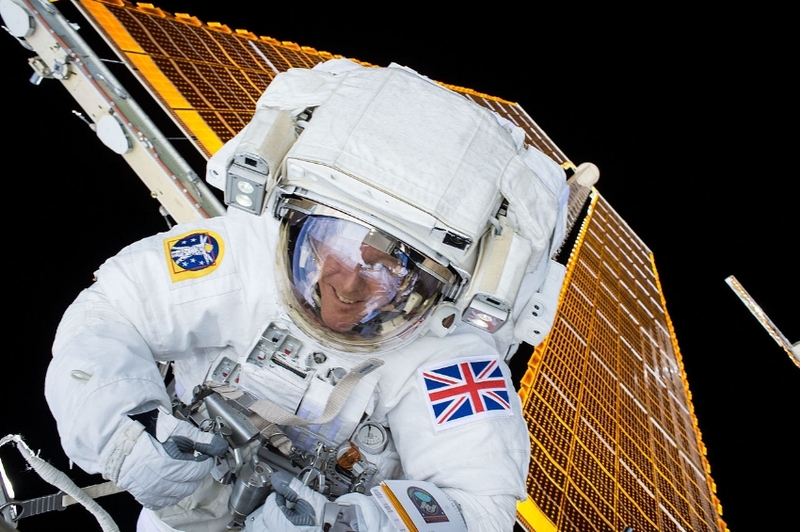 As the first British ESA (European Space Agency) astronaut and only the second Briton to wear the Union Flag patch in space, Peake was conferred the Freedom of the City by his hometown of Chichester and the Queen made him a Companion of the Order of St. Michael and St. George for his services to research and scientific education – all while he was still aboard the ISS. Alongside Major Peake for part of this tour will be our own Colonel Tim Kopra, a NASA astronaut who was a crewmate with Peake aboard the ISS. The two Tim’s (who look quite similar in appearance) will be in Belfast, Edinburgh, and London in what is expected to be an engaging series of events about their time working and living in space, as well as inspiring others to become astronauts, so that they may explore space and make new discoveries for the benefit of mankind. On a wider scale, there is the potential for Britain to develop its own spaceport and having more people interested in space and space travel may well provide additional impetus for such a spaceport to be built. With regard to Tim Peake, there has been an ambitious education and outreach initiative in which the UK Space Agency has invested £3 million to engage over a million young people into his mission and so this tour is also a way for him to thank the British public for their support. On that matter, he remarked that he had been “extremely touched” by that support before, during, and after the ISS mission, and made a particular mention about watching the launch parties attended by so many in the four capitals as he ascended into space last December. Having viewed those celebrations, Major Peake now looks forward to the tour allowing him to partake in those celebrations himself and to thank as many people as possible. One hopes that he will receive hearty thanks from the people of a United Kingdom - wherever they live and are from - who are grateful for his service to the country. In these uncertain times, Peake shows what people ought to aspire to be, and is therefore an inspiration and an example to follow because of the hard work and dedication that has brought him this far, the grace and humility he has shown along with an uplifting personality, and for his love of country. Throughout his mission, Major Peake made it known that he was proud to be British – with his tribute to Her Majesty on her 90th birthday and frequently having the Union Flag nearby in his social media posts – and I do believe that this upcoming tour may be a way to celebrate what is good and decent about being British and sharing in the achievements of a British man which were made possible in part by the UK and its people at large. It may be asking too much for the Peake tour to be anything along the lines of what we have witnessed in the celebrations for Team GB and Paralympics GB following their dynamic performance at Rio 2016, but it ought to at least be something worthy of marking the achievements of Major Peake. Between these two – Tim Peake and the British Rio teams – there is a lot to be proud of as a citizen of the United Kingdom and they are examples of what can be achieved when the country comes together to make beautiful and extraordinary things happen and then commemorate them. With the country as divided as it is along several fault lines, it is sometimes a wonder that such things are able to occur, but I believe that this speaks to the enduring strength and resilience of a country that has withstood so much throughout its long existence. When there is a common sense of purpose, differences can be broken down to allow for synergy among different people (for the UK is a union of people as well as a nations) to work together as one, which instills pride in themselves as individuals and as something greater than themselves. Going forward, the virtue of working together, achieving together, and celebrating together as a United Kingdom will be invaluable as the country enters into uncharted territory. Perhaps the tour by Major Peake throughout the UK can help serve as a reminder to the British people of who they are and what they can aspire to become, while striving to build a better country, and indeed a better world, along the way. Of all of Britain’s cities, perhaps Edinburgh has the most picturesque views – from Calton Hill to Edinburgh Castle and Arthur’s Seat. Any of those places presents an opportunity to take in panoramic vistas, so as to include the two other high points and the city below with much history visibly contained within it. That history begins with early human settlements in the area through the Bronze and Iron ages which eventually became home to a Brittonic Celtic tribe known as the Gododdin, who by the 7th Century AD had built the hill fort of Din Eidyn or Etin and therefore provided the basis for what would become the name of the city. Upon being attacked by King Oswald of Northumbria in 638, the fortress and much of the Lothian region around it along the Firth of Forth was absorbed into the Anglian kingdom for the next three centuries until 950, when it was captured by the Kingdom of Alba in the reign of King Indulf. About two hundred years later in 1125, David I of Scotland granted Edinburgh its royal burgh charter; it gradually gained status as Scotland’s capital city and James III described it in the 15th Century as “the principal burgh of our kingdom.” The city became the center for the Scottish Reformation and the religious conflicts of the 17th Century, which helped to lead to the Wars of the Three Kingdoms and the downfall of the House of Stuart with the execution of Charles I, whose father James VI had succeeded to the English throne in 1603 as James I and therefore became the first man to rule all Britain in a personal union known as the Union of the Crowns in which England and Scotland remained separate kingdoms. Scottish support for restoring Charles II (the son of Charles I) resulted in the occupation of Edinburgh by the New Model Army of Oliver Cromwell. Following the restoration of the monarchy in 1660, Edinburgh continued being the capital of an independent Scotland until the Acts of Union was passed by the English and Scottish parliaments in 1707, which united England and Scotland into the Kingdom of Great Britain and thus merged the two parliaments into the British Parliament in London. Throughout the 18th Century, it continued to prosper and became an increasingly important banking center, though it remained densely populated and crowded due to staying largely within its medieval boundaries. Following the defeat of the Jacobite armies of Bonnie Prince Charlie which had occupied it during the Rising of 1745, the city embarked to stimulate economic activity and affirm its loyalty to the Union and the Hanoverian monarch George III with the development of the New Town to the north – which included elegant Georgian and neoclassical architecture and extensive planning (and was put on display for George IV during his historic visit in 1822). This, along with the city being at the heart of the Scottish Enlightenment and home to intellectuals such as Adam Smith and David Hume, gained Edinburgh the nickname “Athens of the North”, and among the lasting impacts of the Enlightenment was the Encyclopædia Britannica, which was designed in Edinburgh by Colin Macfarquhar and Andrew Bell. Through the 19th and early 20th centuries, Edinburgh continued to grow within the county of Midlothian (also known as Edinburghshire for its county town) and it was granted city status by Queen Victoria in 1889. Compared to other urban areas of the United Kingdom, it industrialized little and was overtaken by Glasgow as Scotland’s largest city and the second city of the British Empire. Nonetheless, it still had some industry in the form of printing, brewing, distilling, engineering, and rubber works, and the central area in the New Town developed into a significant center for business activity and shopping, while the Old Town was given a Victorian make-over and further improvements. In the latter half of the 20th Century, the city went through a decline with the loss of some traditional industry, but has undergone several regeneration projects, as well as taken other steps into the present to solidify its position as the UK’s second largest financial and administrative center after London. Today, the city is also the seat of the devolved Scottish Parliament, which was established in 1999 with some exclusive areas of responsibility for domestic policies affecting the people of Scotland within the United Kingdom. With a population of 492,000, Edinburgh is Scotland’s second-largest city and seventh-largest in the UK, and is home several internationally-recognized landmarks and institutions, many of which are located in the Old Town and New Town sections, which together have been designated as a UNESCO World Heritage site. It is also a center for education, law, arts and sciences, medicine, and engineering, as well as cultural attractions such as the Edinburgh International Festival and Edinburgh Military Tattoo and still further, various historic sites which help to make the city the UK’s second-biggest tourist destination after London. Among those historic sites is the Palace of Holyroodhouse (or Holyrood Palace), which has its origins in the 12th Century when David I of Scotland established Holyrood Abbey on the present site and the abbey guesthouse became the foundation for the royal residence which from the 16th Century forward had become the principal residence for Scottish monarchs and subsequently British monarchs when carrying out official duties and activities in Scotland, including Queen Elizabeth II, who moves her court there for one week in the summer known as Holyrood Week. Located opposite of Edinburgh Castle at the foot of the Royal Mile in Edinburgh’s Old Town, the building is set in a quadrangle arraignment and the exterior of the palace as it is known today was largely built in the Baroque style of Sir William Bruce between 1671 and 1678 following the restoration of Charles II. The northwest tower was built over a hundred years earlier by James V, but Bruce provided for a matching tower to the southwest and the two were linked together within the overall plans which blended the palace into an overall coherent design, especially with regard to its front façade. Inside, the palace presents some of the most stately and well-appointed rooms in Britain, and they reflect that tastes of successive monarchs over the centuries, with a rich variety of interior styles, artwork, and other furnishings. In terms of rooms still in use today by the Queen and other members of the Royal Family, there are the State Apartments which include the Throne Room, which is used for receptions and ceremonies such as the installation of new Knights and Ladies of the Order of the Thistle, the highest order of chivalry in Scotland and second-highest in the UK. There’s also the Royal Dining Room and the Morning Drawing Room, where the Queen receives the First Minister of Scotland and other dignitaries, including foreign ones, for private audiences. On the other side of the building to the north is the Great Galley, which is the largest room in the palace and most notable for the Queen carrying out investitures for Scots bestowed with knighthoods and other honours, as well as other banquets and ceremonies. Within this room are portraits of Scottish monarchs, including legendary and real ones, and indeed, there are many more portraits of monarchs and other royals up the present throughout the building. Of particular interest are portraits of both the deposed and defeated Stuarts such as Bonnie Prince Charlie along with those of their Hanoverian cousins who emerged triumphant in the struggle for power during the 18th Century, which is emblematic of the complicated and extraordinary history of the UK. That history is seen in the form of the chambers and apartments of kings and queens from long ago. Among them is the suite of rooms designed for Charles II, including the King’s Bedchamber, which – per the tastes of the Merry Monarch – is the most lavishly decorated room of the palace with richly carved woodwork and plastering, along with tapestries and the luxurious State Bed. In addition, there is the King’s Ante-Chamber, Wardrobe, and Closest. From here, the rooms are connected via the Great Gallery to the northwest tower, which is where the apartments of Mary, Queen of Scots and her husband Henry Stuart, Lord Darnley are located. These historic areas are among the least changed since Queen Mary’s time and because of that, they give a sense of the tumultuous events which enveloped her short reign. The first floor features the Darnley rooms, which are linked via a spiral stair to the identical set of rooms occupied by Mary, including her Outer Chamber, where she received visitors and which now features a collection of Stuart and Jacobite artifacts. This leads to her Inner Chamber, which is said to be the most famous bedroom in Scotland. Many of the paintings and other features date from Mary’s time and before that, including the oak ceiling which bear the monograms MR and IR for her parents, Mary of Guise (Maria Regina) and James V (Jacobus Rex). Other items, such as the Flemish tapestries, are more recent but still add to the mystique of this room and the infamous woman who occupied it. Elsewhere in the palace complex is Holyrood Abbey, which is attached to the palace, but has been a ruin since 1768 when its roof collapsed but still stands as a beautiful piece of Medieval architecture. The forecourt features a fountain installed by Queen Victoria (which emulates a similar one at Linlithgow Palace), as well as a nearby statue of her son, Edward VII, which was unveiled by his son, George V, who brought the palace into the 20th Century by overseeing extensive improvements during his reign, including the installation of central heating and electric lighting. In addition, the Queen’s Gallery is located to the west of the palace and exhibits works from the Royal Collection; next door to it in the Mews Courtyard is the Café at the Palace, which serves mostly light meals and – so quintessentially British – tea in the afternoon, and the palace gift shop is also nearby to collect mementos. Furthermore, there are the overall grounds and gardens of the palace – where the Queen hosts garden parties – which expands into the vaster Holyrood Park (aka Queen’s Park) and includes Arthur’s Seat and Salisbury Crags, whose peaks contain some of the best views of the area. Back at the palace, audio tours are available via a device which allows visitors to listen to commentary on Holyroodhouse and the people who have lived there as they make their way through the building. Admission is available for different levels of access to the palace and its surrounding areas, and in this year until October 16th, it includes access to a special exhibit in honor of the Queen’s 90th birthday entitled Fashioning a Reign: 90 Years of Style from The Queen's Wardrobe. For larger groups, bookings are available for private and personally guided tours by Scottish Blue Badge Guides, and there are special accommodations and features for school groups, children, and those with disabilities (except for Queen Mary’s apartments, which cannot be accessed by wheelchairs). Holyroodhouse is open year-around save for Christmas and Boxing Day, but it is still a working palace, so one ought to be mindful of any comings and goings by the Queen, other members of the Royal Family, and still others who are allowed use of the building, such as the Lord High Commissioner to the General Assembly of the Church of Scotland, which may affect the palace’s availability to visitors. Even in such circumstances however, it will be good and fascinating to witness the palace being used for its stated purpose in the service of its Queen. Indeed, Holyroodhouse is royal treasure of Scotland and the whole United Kingdom on par with Buckingham Palace and Windsor Castle. It is a must see for anyone visiting the country and in particular, can serve as a foundation for touring and getting to know the great city of Edinburgh.